We are now in the whirl of nature festivals in the Central Valley. Come to see us, our birds, and our display of wings, feet, bones, and live birds at the Walk on the Wild Side festival in Freeport, May 18. Our booth is open from 10 AM to 4 PM, and we’ll have many goodies to show and tell. Meet our Ambassadors from the Wild: Murphy the Red-tail, Clicky the Western Screech Owl, and Bolt the Peregrine Falcon, who will be on hand to greet you! 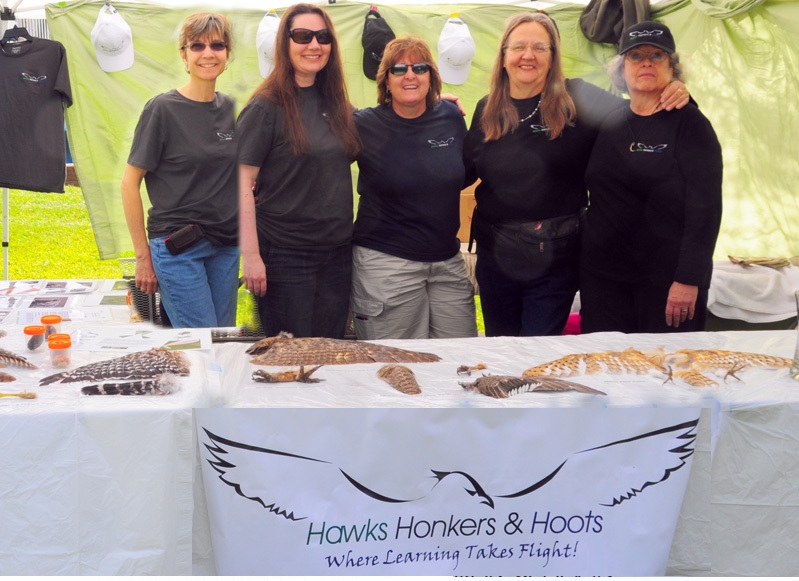 Past Attractions: In April, HH&H made quite a splash at the Creek Week Festival in Carmichael, CA, with our display of wings, feet, bones, and live birds. Kids participating in the yearly creek clean-up gathered afterward at the exhibitors booths. We had a crowd for several hours all around our booth, getting points on their cards for finding camouflaged owls in photos and learning – among other things – how feathers serve birds and what’s on the menu for these fierce, beautiful raptors. At Creek Week, joining Kelli Moulden, HH&H President (center), were Dr. Carol Standen (far left), our Vet of Record, Tracy Langlands (second from left), Becky Kirsch (not pictured), Liz Williamson (second from right), and Sallie Reynolds (far right). Also joining us were two of our Ambassadors: Murphy the Red-tailed Hawk and Clicky the Western Screech Owl. All our birds were once wild, but suffered injury or illness and were brought by Good Samaritans to rehabilitation organizations. They are now healthy but non-releasable, unable to recover from their injuries well enough to survive in their old life of exciting but difficult freedom.